Before there were fashionistas like Victoria Beckham, there were the Eliott sisters, Beatrice and Evangeline. The two sisters in the delightful series The House of Eliott take their flair for design and style and turn it into a thriving fashion business. The DVD release of the complete collection includes all 34 episodes from the 3 seasons of the series which originally ran from 1991 to 1994. The series was created by the same team that brought us the classic series Upstairs, Downstairs, so you know you're in for some compelling story lines! 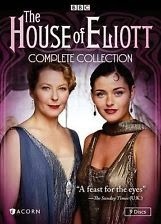 The series begins with the death of Bea and Evie's father in 1920. The unmarried sisters lived with their widowed father and don't have much connection to the outside world. Bea is 12 years older than 18-year-old Evie and, because their mother died when Evie was born, has served as something of a maternal figure for Evie. Their pompous and somewhat slimy cousin, Arthur, has been appointed executor of their father's will, as well as Evie's legal guardian until she comes of age. 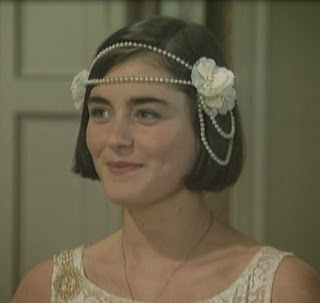 It falls to Arthur, who is a solicitor, to tell the girls that not only did their father not leave them anything in his will, but that there was really nothing to leave. He had even mortgaged the house, so that the girls were soon going to have no place to live. The sheltered sisters were hit hard with the reality: they had no money, no skills, and no home. Since this was soon after the end of World War I, they would also be competing with millions of other unemployed people for the few jobs that were available. Luckily, Evie is friends with Penelope Maddox, who suggest that her brother Jack might need an assistant for his photography business. This turns out to be just the lifeline the sisters need. 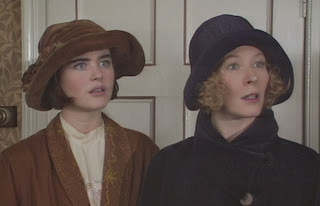 Not only does the no-nonsense and efficient Bea soon become indispensable to Jack, but the sisters move into a flat above his photography studio. Aunt Lydia, Arthur's socially conscious mother, recommends Evie for a position at Partini's dressmaking shop. Because the sisters had lived with little money from their father all their lives, they had been accustomed to making their own clothes. This fortuitous position is their entry into the world of fashion. Soon the sisters move up to ever more prestigious fashion houses, while continuing to do designing and dress-making for private clients. When an employer becomes enraged at their creativity and flair for design (which makes his own creations pale in comparison) and fires them, the Eliott sisters decide to strike out on their own. They encounter many financial difficulties along the way. Cousin Arthur, while not embezzling their money, does not inform them of everything they inherited from their father. He also doesn't tell them that their father had a long-term mistress and, allegedly, an illegitimate son. This son, Sebastian, eventually turns up expecting his share of the inheritance. All of this makes starting their own business a tricky proposition. At the same time, the crusading figure of Penelope reappears, championing the rights of the poor and commenting loudly on the ridiculous ways of the rich, who waste extravagant amounts of money on clothes when that money could be put to better use for social causes. In addition, the sisters must contend with busy personal lives, employee difficulties, rival jealousies and professional set-backs. Unfortunately, the series was abruptly cancelled by the BBC after series 3, so there is no big resolution to the series. Still, it's very enjoyable to follow the trials and tribulations of the Eliott sisters, two young women forced by circumstances to support themselves at a time when female businesswomen were a rarity. Several familiar faces turn up, including a young Minnie Driver and Burt Kwouk (Cato from the Pink Panther films). Many fascinating extras make up the set, including a booklet containing an interview with the series co-creator Jean Marsh, who describes how the series was created. There are also very interesting production notes, including information about the filming -- which cost £6 million for the first season! I imagine the majority of that was spent on the lovely fashions that everyone (well, everyone but Penelope, who had more important things than fashion on her plate!) wore. There is also an interview, 10 years after the series ended, with a glamorous Louise Lombard, who played Evie.